Whether you are building or renovating your kitchen, it is critical that you get the cabinets right. 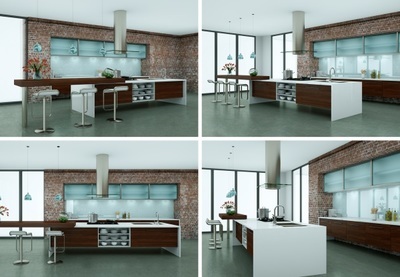 With kitchen designs changing almost every second, it is very difficult to be at par with the world. What you can do is hire a kitchen cabinet maker, instead of opting for generic furniture and customize your kitchen. A cabinet expert will be able to sit with you and make a detailed design that would cater to your needs and lifestyle. If you are renovating the kitchen, it is important to check if the previous designs can be incorporated with the newer ones. A lot of people prefer that, especially if the house has indigenous designs. A kitchen that needs to be completely renovated is much like a canvas to a cabinet maker. User friendly designs are easier to execute than you think. Rotating and revolving mobile kitchen cabinets are the best way to simplify and un-clutter the room you are most likely to spend the most of your free time in. A cabinetry expert will be able to coordinate the design of your house, however old or futuristic it might be with kitchen cabinets which will blend it with the decor. It is a noble idea to make the decorator work with the cabinet maker, so the work is in sync. Commissioning someone to make your very own kitchen cabinets is as flexible as it gets. If you have a change of mind at any point, all it needs is a quick consultation and the design will be accommodated according to your preference. What material you use in making a cabinet is equally important. If you’re using wood, the hardness, grain and color, cell structure of the tree are the points to be noted and observed before investment. If it’s a non wood material, do a proper market survey and speak to other users before going in. A cabinet maker could put in his two cents if asked, cashing in on his experience would be wise. When you decide to hire a kitchen cabinet maker, ask for samples of his previous work. If possible, check on some older works by visiting his past clients, so you can verify if the work remains afresh during the course of time. Ask the maker if he paints his furniture. The final finish of a cabinet is critical to the design. If the paint work is being outsourced, take your pick of the best affordable painter in the market. When inquired, if a professional says he doesn't build the cabinet doors by himself, he is not someone you should hire. An expert will build his own cabinet door rather than using a generic store version. With the kind of money that goes in the designing and creation, there should be no compromise. Ask for a tour around the workshop where the cabinet would be made. This should give a fair idea about how the cabinet maker works, whether he works on all the pieces of the furniture in house or not. Always look out for a license or a certification prior to hiring a professional. Cabinet making involves a lot of money including advances. You don’t want to be defrauded. If possible, contact the previous clients of the maker to inquire about the quality of furniture, delivery schedule and behavioral issues, if any. This will let you not only hire the right person, but also be in charge. Cabinet making is an art and a well made cabinet could instantly improve the look of your kitchen Choose your kitchen cabinet maker wisely and carefully, keeping in mind your budget and lifestyle. Hope you like the about mentioned information about kitchen cabinet maker Melbourne. If you want to know more then go here and get some useful information.